While HyperX has long solidified its place in the market for headsets and memory, the last couple of years have seen them expanding their peripheral offerings to include gaming keyboards and mice.They introduced the excellent Alloy FPS Mechanical Keyboard with Cherry MX Blue switches last year, then a few months later added Cherry MX Red and Brown switch options. 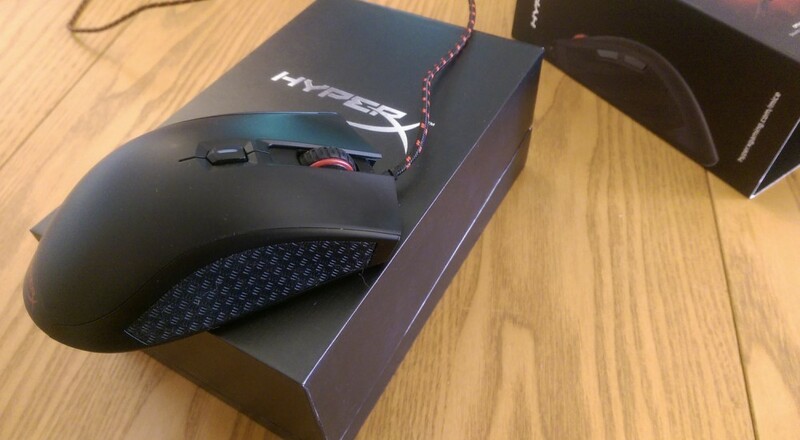 Their foray into the world of gaming mice kicked off this April with the release of the HyperX Pulsefire FPS Mouse. The Pulsefire is a six-button, lightweight optical mouse for the right hand with textured rubber siding. The six buttons are all quite basic: standard left and right click on the top, one mouse wheel button, two long buttons on the left side positioned for thumb use, and one DPI setting button. There’s red LED backlighting for the mouse wheel, the HyperX logo at the bottom, and the DPI button (the color on this button will change based on which DPI setting you select). The braided USB cord connects in a slightly elevated position at the front of the mouse to cut down on cord drag. The physical design of the Pulsefire is simple, but that’s certainly not a bad thing. When using the mouse, I liked how the smooth texture of the plastic faceplate was juxtaposed with the rubbery side grips. 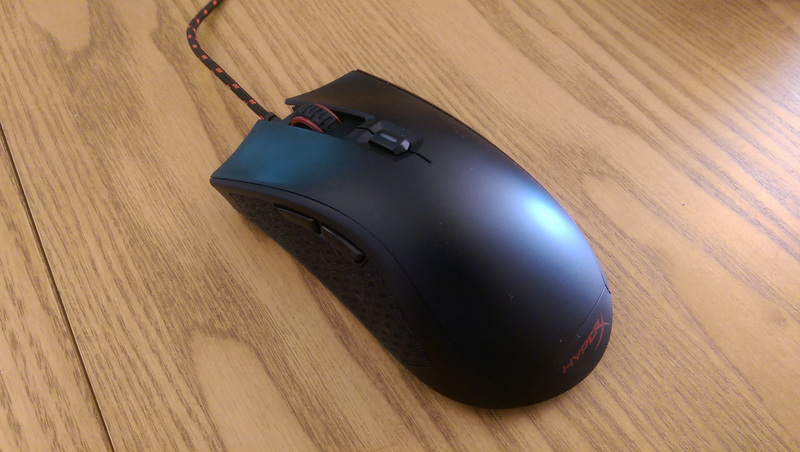 When moving it around on the mouse pad (HyperX also sent me a HyperX Fury S extra large gaming mouse pad to pair with the Pulsefire), it glides smoothly with very little weight resistance, feeling light without feeling cheap. The mouse also moved around well on my old mousepad (which was made out of gel), but since I switched to a lower DPI setting, I required a larger surface that one afforded me. One thing I noticed was the mouse is a bit wider than most other mice I’ve owned, but it didn’t feel uncomfortable in hand. I’d generally move onto the mouse customization software at this point in the review, but interestingly enough, the Pulsefire is software-free. HyperX has really been embracing full plug-and-play in their peripherals, which I’ve been appreciating more and more over time. Rather than having customization software where you manually set your DPI, the Pulsefire uses its DPI setting button to handle that instead. The DPI button has four settings with their own color backlighting indicator: 400 (white LED), 800 (red LED), 1600 (blue LED), and 3200 (green LED). I’ve been using this mouse primarily for Overwatch and Heroes of the Storm when gaming, and I’ve been happily playing these games with the 800 DPI setting.